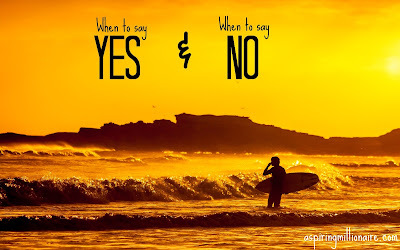 Behind the “Yes” life is an attitude of adventure, acceptance, and pushing your boundaries. When you say “yes,” you’re opening the door to unseen opportunities that can arise that you never would have thought existed. Behind the “No” life is the ability to set boundaries, establish self-respect, and maintain some sanity without giving so much of yourself away to others that you have nothing left for yourself. Neither is completely right when taken to the extreme. Saying yes to everything can push you to do things that are detrimental to your values, but saying no to everything in order to insulate yourself can be its own form of limiting narcissism. Why are you not comfortable? Is it because it’s outside your comfort zone? Or is it something that goes against your moral code? If it’s something that is pushing you to be brave, consider doing it. Whether it’s going to a networking event to meet new people, or singing in front of a group of people, pushing yourself outside of your comfort zone opens you up to enriching experiences, and allows you to meet new people along the way. When you say yes in these circumstances, you’re more likely to run into new opportunities than if you hadn’t. Even if each and every experience doesn’t turn out well, life is for living, not for hiding. If you’re feeling uncomfortable because it is against your moral code, don’t do it. Just because there is pressure to sleep with someone after going out for a while doesn’t mean you should do it if you believe in abstinence until marriage. Just because friends invite you to come hit the town with them doesn’t mean you should tag along if you know they are trying to get their sober friend to drink. It might be a fun time, but if it’s something you’re going to regret it’s not worth it in any way, shape, or form. Why do you not have the time? What will you be doing instead? If you’re going to be sitting at home binge watching reruns of Buffy the Vampire Slayer, drop the excuses and go participate. If, however, you’re being asked to make a commitment that you genuinely don’t have time for, know that saying, “No,” not only benefits you, but also those you’d be letting down when time constraints kept you from fulfilling your responsibilities. Whether in business or your personal life, people will sometimes reach out to you asking for a favor. In either case, it’s usually best to say, “Yes.” It’s good to help people, and doing so without the expectation of return is the most valiant way to do it. If you need more than that, know that at some point in our lives we all need favors, and if you don’t help others when they need it, there will be less people around to help you when you are eventually in the same boat. If you’re being taken advantage of, it’s okay to say, “No.” Maybe someone’s repeatedly come to you again and again. Despite your best efforts, you feel like your help is just putting them back in the same situation over and over. Maybe you don’t have the resources to sustain the favor giving, whether that be time or money. In business, maybe someone’s taking advantage of your reputation of lending a hand in order to build themselves on your name. Help others. Be kind. But don’t let them walk all over you. Live life whole-heartedly. Say, “Yes!” to everything you can, even if it makes you uncomfortable or forces you to get out from in front of the TV. But don’t become addicted to that three letter word. 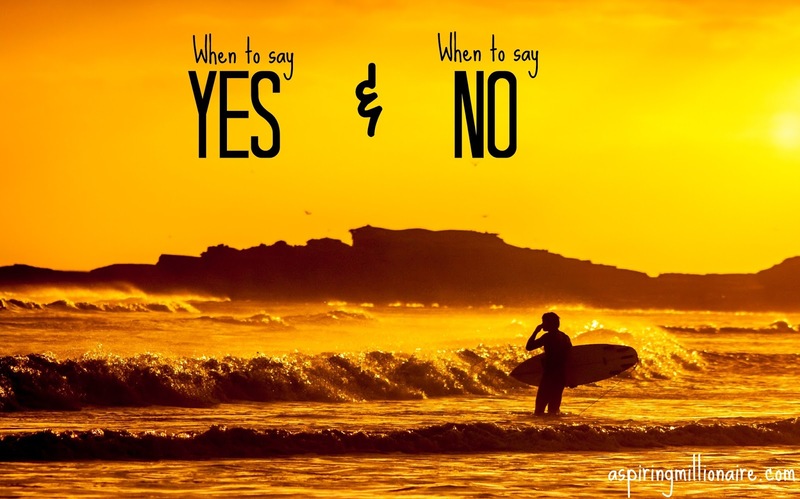 Use “no” to set boundaries, and prevent from making commitments you can’t keep. Life is about balance. Balance the ability to fully enjoy all the world has to offer without letting the world compromise your standards or sense of self.